At this stage in my life, another factory visit does not exactly cause any excitement. However, I admit that I was very curious about the massive Nissan plant near Sunderland in the north-east of England. I’ve admired from a distance the success story of this 28-year-old facility in neighbouring England where more than 7,000 people are employed by the Japanese carmaker. The bigger picture is that the plant actually supports an estimated 40,000 people in manufacturing, design, engineering, sales, and marketing jobs in the UK. So I packed my bags and combined my visit to Europe’s largest car plant with the launch of the all-new Qashqai, the latest incarnation of another phenomenon that has gone from strength to strength. It was interesting to be there for the start of full production of the new Qashqai. Last year, more than 286,000 of the 501,756 cars built by Nissan’s Sunderland workers were Qashqais, and it is now in its eighth year of production. 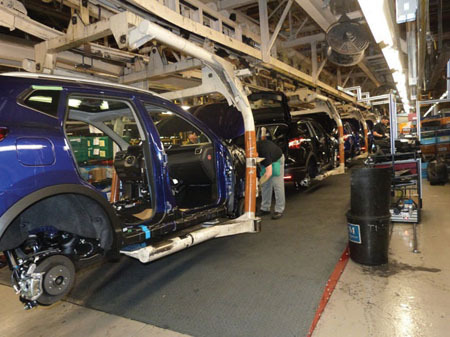 In fact a new Qashqai comes off the plant’s Assembly Line 1 every 61 seconds. And this line has been running on 24-hour operations since 2010. Other cars produced here include the Leaf EV, new Note, Juke, and Nismo models. Plans are also well advanced to add a new line to build a new Infiniti premium compact model at the factory. And the new Q30 will be the first Nissan production vehicle in Europe to be built on the new Common Module Family (CMF ) Renault-Nissan Alliance platform. The first of many I suspect. So what about the factory floor tour? I ventured in among the 828 robots that operate in the factory and on to Line 1 where they make 3,367 welds on each Qashqai and along with the army of manufacturing workers, they assemble a thousands of parts in building each new Qashqai. I refer to the robots because it's worth noting that in 1998 when the plant opened, it produced 5,600 cars in the full year, with a ratio of 80 per cent manual and 20 per cent automatic processes. Now, the plant produces more than 10,000 cars every week, with a production ratio of 90 per cent automatic and just 10 per cent by manual process. Every line worker, and even supervisors and office staff are trained to do multiple jobs, with at least three people trained to do every particular job on the line. The message is clear, the line keeps going with qualified people in every position, no matter what. The work schedule is controlled by computer, with everything in its proper sequence. And it takes about two minutes to change over hundreds of people on each shift, but when the buzzer goes, they don’t leave. They stay until the car they are working on is finished with everything they had to do. The new operator coming on-shift then starts on the next car. And just to awaken our Government to one reason why we cannot attract such facilities to our shores is that manufacturing salaries paid in our high tax economy are too high. An assembly line worker in Sunderland starts on £19,000 (including shift allowance ) for a 40 hour week, rising to £21,000 after two years and with a career high of £27,000 possible for that level of position. My guide mentioned that the manual work is deemed far too strenuous for women operators, but there are women supervisors. On a tour of a large Skoda plant in the Czech Republic a few years back, there were more women than men working the line and it had higher productivity and higher quality of work at that time than Volkswagen workers in Wolfsburg had. Maybe it’s the guys watching the girls that they are afraid might have a negative impact on productivity. Who knows? - It takes only three seconds to fit a dashboard module in a new Leaf EV. And everything in that module has been tested prior to coming into the car. - Automated guidance vehicles (AGVs ) keep component levels supplied to each assembly station, drawing from the 1.5m parts in storage at the plant at any one time. - 470 tonnes of steel arrive at the plant every day to be stamped into panels, etc. - Near the end of the line, there is a team carrying out thorough quality checks on everything fitted to the car. They do it from around the car, underneath it, and of course inside it. Every detail is recorded with a sequence number documented, so any problem is traceable. - They also do a full brake performance test with ESP and ABS on a rolling road in a special booth in just under one minute. The results of each test are stored against the chassis number in case of any query later. In addition to the main assembly lines, the plant also manufactures four engines on-site, including two 1.2- litre units (a three-cylinder and a four-cylinder ), as well as a 1.6 and a 2 litre unit. And to complete their requirements, they import the 1.5 litre and another 2 litre unit from Renault facilities. All told, this was a very interesting visit and I learned a lot, not least how far British manufacturing standards have come and how important this Nissan plant is when it comes to delivering quality and value to motorists in these islands.